If you are following a low fat diet, be aware that not all fats are created equal. Your body actually needs fat for optimal health. Healthy fats include monounsaturated fats found in avocado, olives, olive oil, seeds, nuts, nut butters, and nut oils; polyunsaturated fats (better known as omega-3 fats) found in fatty fish and flax; and medium-chained saturated fats, found in coconut meat and coconut milk. Following are three delectable recipes full of flavor and healthy fats. 1. Make a dressing by whisking together olive oil, vinegar, salt and pepper in a bowl. Using a zester or paring knife, remove 1 tablespoon of zest from grapefruit (avoid the bitter white pith underneath the peel). 2. Use a sharp knife to remove peel and pith from grapefruit flesh. Holding grapefruit over the bowl of dressing, cut in between the grapefruit membranes so that the segments and juice fall into the bowl. Squeeze the remaining membranes over the bowl to extract the juice. 3. Place avocado slices in bowl and gently coat with dressing, keeping the slices intact. The citrus will keep the avocado from turning brown. Arrange romaine on four chilled serving plates and evenly divide the grapefruit and avocados among them. Drizzle each with remaining dressing and serve. 1. Preheat oven to 375 degrees F. and put a 13- by 9-inch shallow flameproof roasting pan (not glass) in oven until hot. 2. Place salmon skin-side down on a cutting board and cut into four equally-sized pieces. Sprinkle with salt and pepper. Remove hot pan from oven and place salmon, skin-side down, in roasting pan and roast until salmon is just cooked through and flakes easily when pressed with the back of a fork. Do not overcook or the salmon will be dry. 3. Meanwhile, heat olive oil in a small skillet over medium heat and cook shallots, stirring often, until soft and golden, about 2 minutes. Add sugar and cook, stirring, until sugar is dissolved. Add vinegar and more salt and pepper and cook, stirring, for 1 minute. Transfer to a bowl, then whisk in walnut oil until combined. Stir in walnuts. 4. 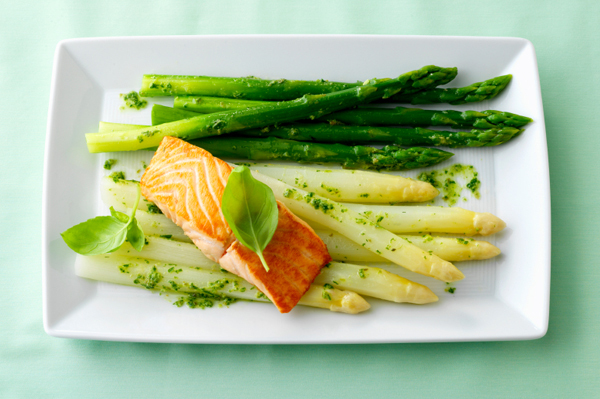 Transfer salmon to serving plates and drizzle with vinaigrette. Serve with sugar snap peas or asparagus. 1. Heat oil in a large nonstick skillet over medium-high heat. Add onion and bell pepper and cook, stirring, until softened, about 6 minutes. Add garlic and cook, stirring, for 2 minutes. 2. Stir in sake and vinegar and let mixture come to a simmer. Cook for 2 minutes then stir in coconut milk. Let mixture come to a boil and reduce to a simmer for 10 minutes or until mixture thickens slightly. Add pepper and salt to taste. 3. When ready to serve, stir in broccoli and shrimp and cook, stirring, for 1 minute or until broccoli and shrimp are heated through. Divide pasta among six dinner plates and divide coconut shrimp mixture, mounding in the center of the pasta, spooning over with extra sauce. Garnish with cilantro and sesame seeds and serve at once. For more information on healthy fats, read Get more fat in your diet. And visit the SheKnows.com Food and Recipes Channel for more recipes with healthy fats.